They ? ?re playing football now, but life could have taken a very different turn for five teenagers in Elkhart after the vehicle they were riding in Sunday night rolled several times. “I held onto the little handle thing of the door and just felt the top smash in, ? said survivor Jordan Simmon. ? ?You just hold on and hope you don’t die. ? But all five would walk away with only minor scratches, bruises and one with a minor concussion. 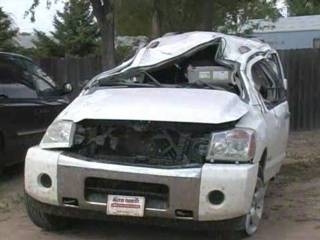 “After looking at the vehicle afterward, it makes me wonder how I’m still alive, ? said survivor Marcus Irsik. The road the boys were traveling on when they got into the accident is dirt filled, slippery and has numerous twists and turns. But there is one thing that every single teenager in the car did that changed the course of their lives forever.
? ?By the look of that vehicle, if we didn’t have our seat belts on — when I look at that vehicle — most of us would be dead, ? Simmons said. Simmon ? ?s parents have been enforcing the seat belt rule since childhood, but some of the teens weren ? ?t buckled up Sunday night until they turned onto the dirt road. “It was the dirt road though, so I thought just in case I would, ? Irsik said. They broke a normal habit that ended up saving their lives.
? ?I never put my seat belt on, that was just one in a million, ? said survivor Derek Painter. The teens are now encouraging others to always buckle up. “Every time I get in a vehicle I put it on, ? Painter said. And Simmon ? ?s mom, Jori, hopes the school will let them put the car outside of the high school as a constant reminder to teens. “This area there have been so many kids and people killed, it’s just not worth it, it takes two seconds, ? she said.